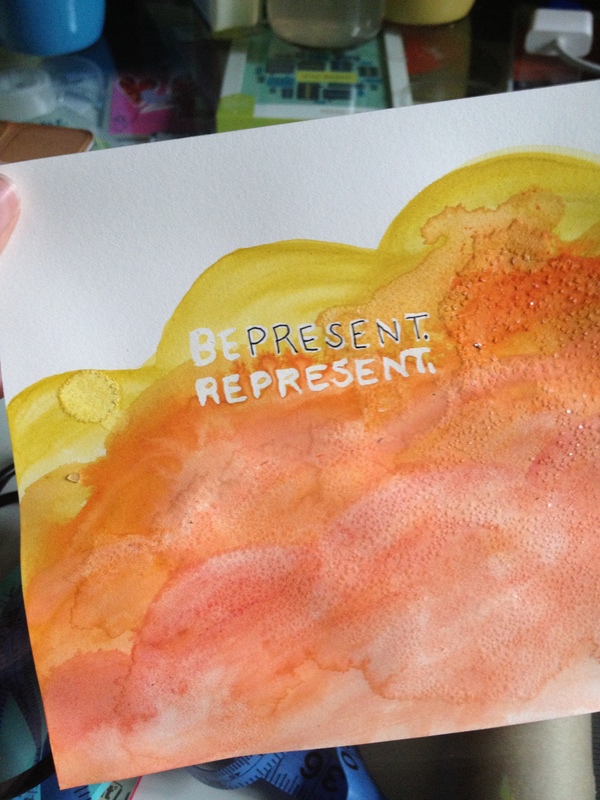 I also have had this idea for the words stuck in my head lately, and wanted to get out a few different typographic representations of “bePRESENT/REPRESENT”. Have a great and creative Wednesday! Hello and Happy Monday! I had an incredibly relaxing weekend, mostly filled with lazing about and reading, spending time with my guy and actually getting a massage. It was glorious. How much do I love this redesign of the Hobbit? And wish I had time to make new covers for some of my favorite books? Part of my new sewing hobby includes wanting to make my own clothes- I love Elsie’s fashion sketching tips for beginners. Pretty sure I’m obsessed with finding/making rugs lately, because I can’t stop thinking of using this idea to cover the chilly floor in my office. I’m loving this series from OMHG on how to price as a creative. Here’s Part 1. Yum. Nutella recipes from the talented Joanna Goddard. 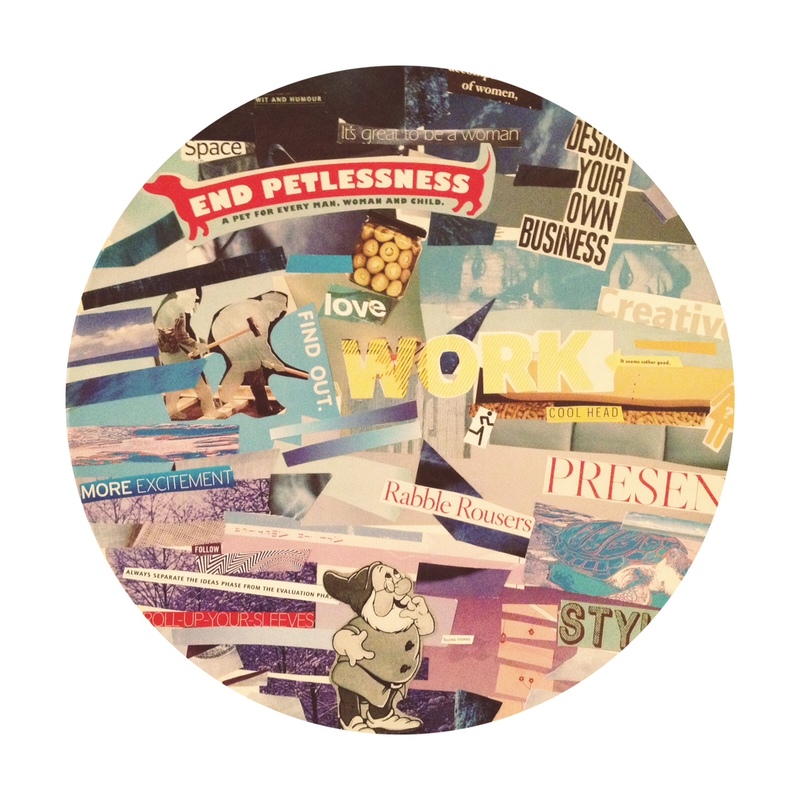 This recap of Alt Summit 2013 reflects my recent vision board realization that the company of women is important- as friends, coworkers and inspiring creative spirits. Why do I love Marquee Lights so much? I see this as a great basement project. 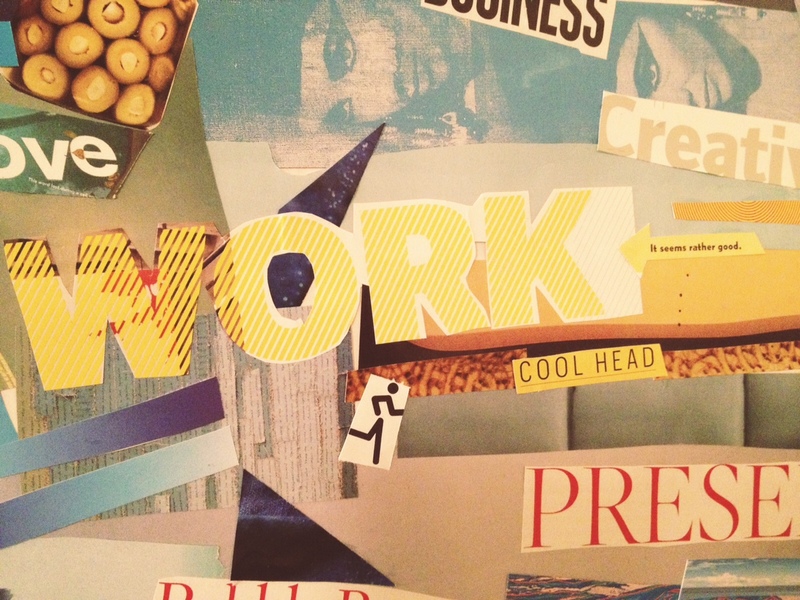 A great thing to keep in mind – Bri and Katie tell us why they love to freelance. Is this pushing the line of “too girly” for curtains, or are curtains by nature a girly thing and I should just start putting pom poms on everything I own? Because you know I will. I keep falling into the busyness trap- I’m too busy busy busy. Sarah gives some good pointers for keeping your sanity while busy– but I’m still aiming for that perfect middle ground- work less, work harder and ultimately get more done. I can be pretty sensitive to noise levels when concentrating at work, and this little big detail blew my mind- adjust the volume in 1/4 increments on OSX! It’s so fun to see Elise in her process toward becoming a mother- I love the colors and patterns she’s chosen for this baby quilt. 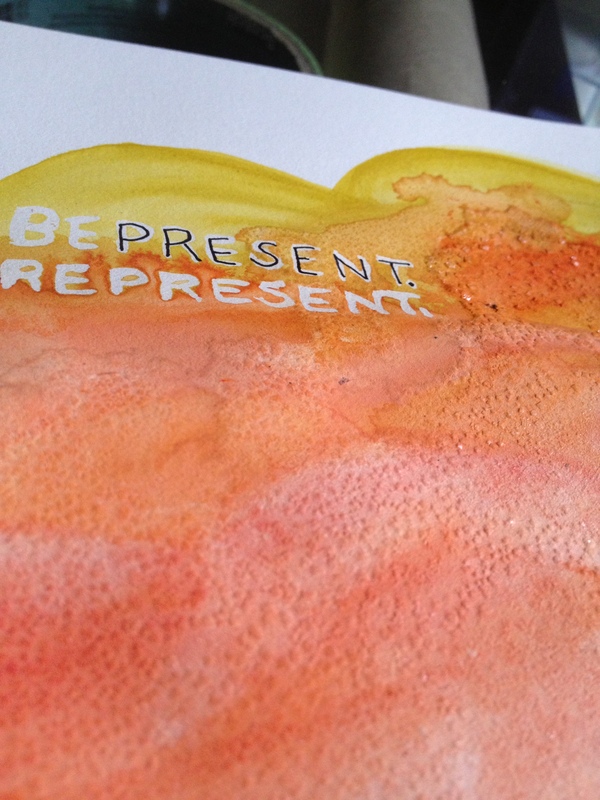 This blog post came to me at an especially timely moment last week- and lifted my spirits! What makes an artist? I’m going to make these biscuits this week, as soon as my sugar high from Valentine’s day levels out. Did I already mention I’m obsessed with light up letters? This seems simple enough, right? I probably spent way too long watching this and laughing. Goats. Yelling. Like humans. A new favorite photo editing tool for the iphone- over it. And lastly, this pretty much sums up my weekend. I’m pretty pumped about this week’s project. It combines work on the computer and working with my own two hands, and I’m pretty happy with the results! 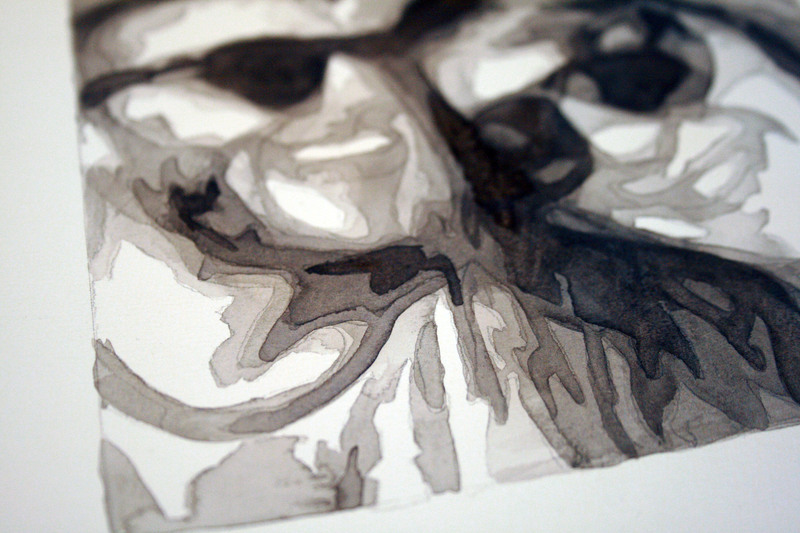 From the close up of this, you’ll see that this peice involved quite a bit of layering. I essentially took a black and white picture of myself and Kyle that I love, ran it through a couple programs to reduce it to six shades of gray (insert literary joke here) and then painted it in layers, with the lightest layer coming first, the later layers adding to the darkness. 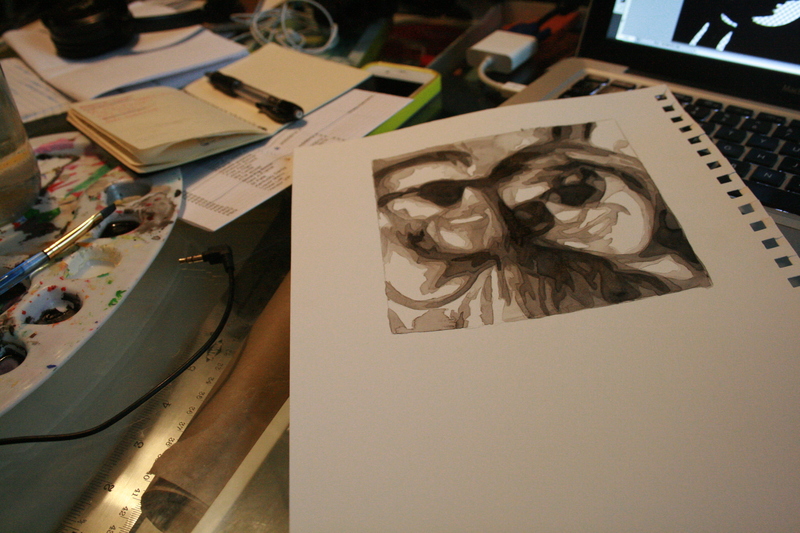 Each was was about the same color and opacity, but because it built on existing color, it got progressively darker. I’m pretty enthusiastic about this and looking for my next photo to do! And contemplating how I could start incorporating more color. Aside from the lovely ladies in attendance, a few of them dear friends and incredibly inspiring to me as professional women, I really took to heart one particular lesson from our workshop, and that was to take time for introspection. I enjoyed thinking purposefully about my last year, my goals, my successes and what’s driving my motivations in 2013. It was nice to take the time to really put some answers out there, and to set intentions through artistic expression. 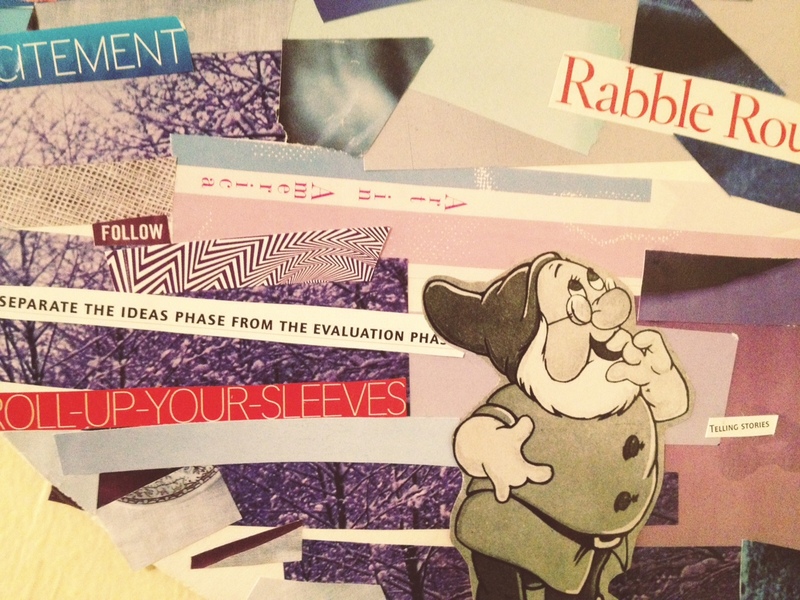 Because we did- through collage! My phrase for this year actually comes from a card a sweet friend gave to me during a transitional time last year. 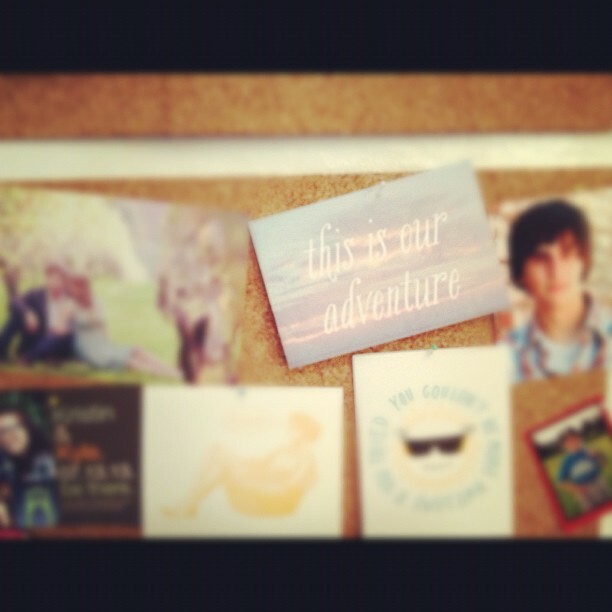 It said “This is Our Adventure”, overset on a sunrise. I’ve always kept this card near my workspace, and drawn energy from the idea that this life is a shared, unpredictable experience- and that’s a wonderful thing. The card that inspired my board. 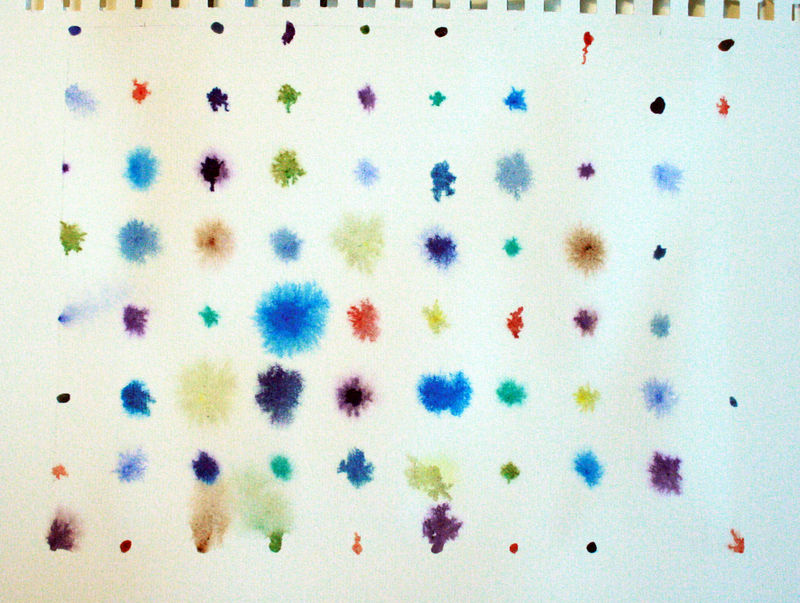 Also, I found this old watercolor that has given me a few ideas…. I’ve been getting over a nasty bout of illness – the 24 hour bug bites hard! Be safe out there, and wash your hands regularly!! Hello there! For today’s post, I thought I’d share one of our little household projects that came together in the last week or so. 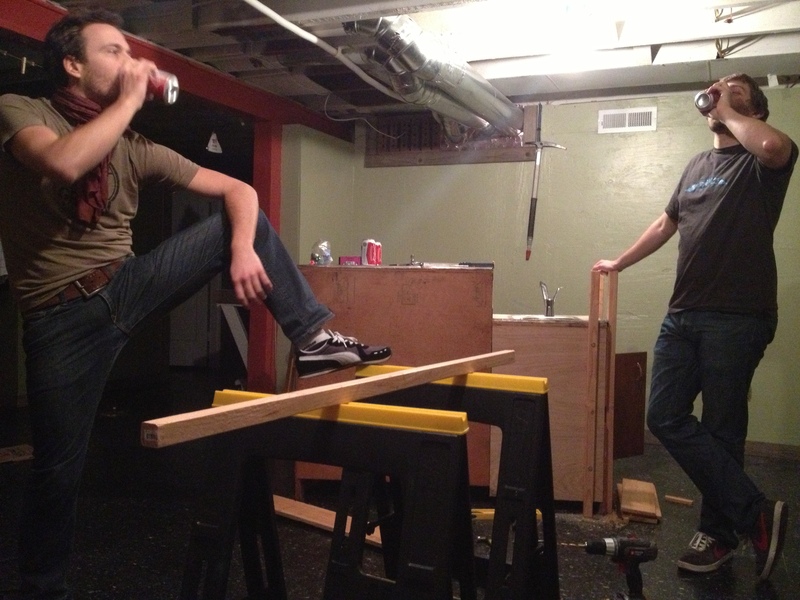 Because this was Kyle’s braintrust and I did absolutely nothing to help him in this, I thought it would be only appropriate that he share his process in putting together our fabulous basement bar. Take it away, Kyle! This project began with a mop. A day or so after we moved in, I was mopping the basement and broke my water bucket. The puddle grew as I watched, dumbfounded and still, which is my go-to response in moments of crisis requiring swift action. [editor’s note: that is true.] Luckily, the problem took care of itself by sliding down the recessed drainage hole in our basement floor. Wait, the linoleum floor in our partially-finished basement has a drain capable of swallowing even bucket-sized spills? 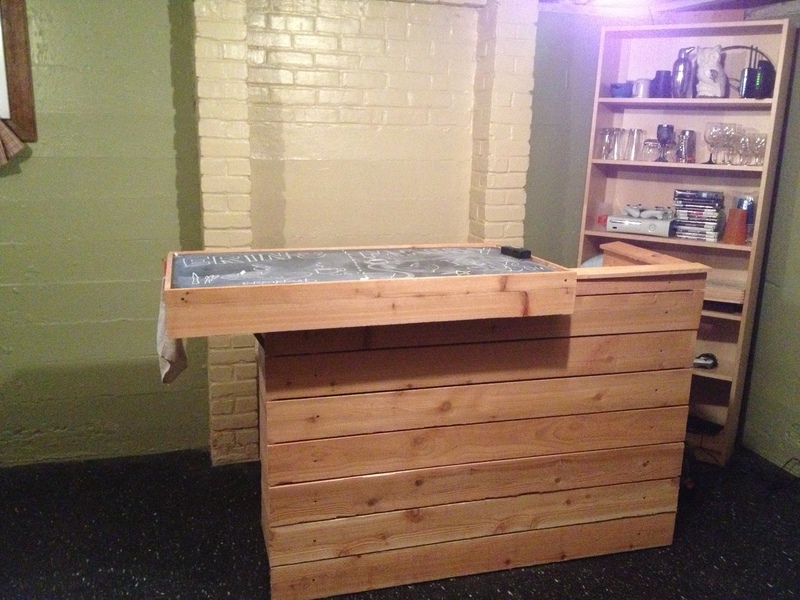 Basement bar! The process started with a trip to the ReBuilding Center on Mississippi St. where I bought part of a small, old kitchen cabinet for $65. 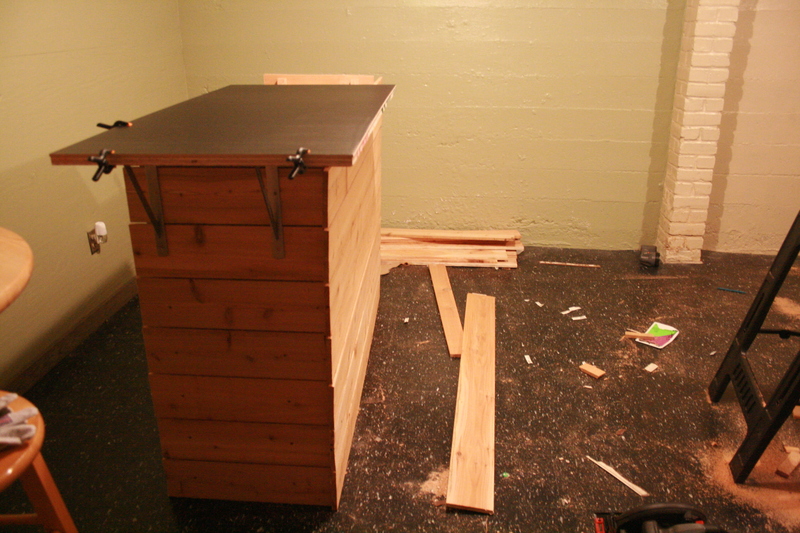 The plan from there was to build a sort of facade around the cabinet and slap an overhanging surface on top. I wanted the whole thing to be relatively easy to disassemble, so I attached the facade to the cabinet with 2×2″ posts that could be unbolted without removing every board. We were going for a rustic look, so I screwed some cedar fence boards to the 2×2’s with about a 1/4″ (exactly one Bananagram tile) gap between each. 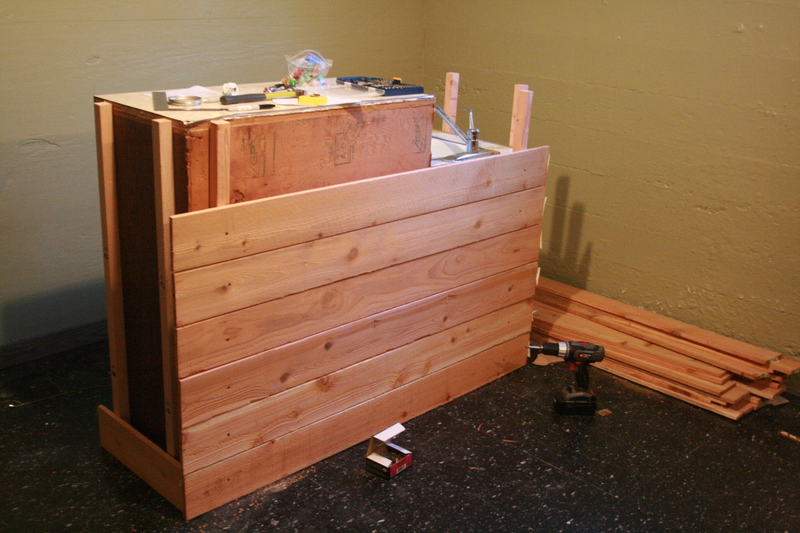 Five footers turned out to be just the right width to overlap the side panels, which I decided was conveniently rustic. For the top, I chose a 2×4′ piece of plywood. This turned out to give the bartop the perfect amount of overhang for one person to sidle up on one of our wooden stools. 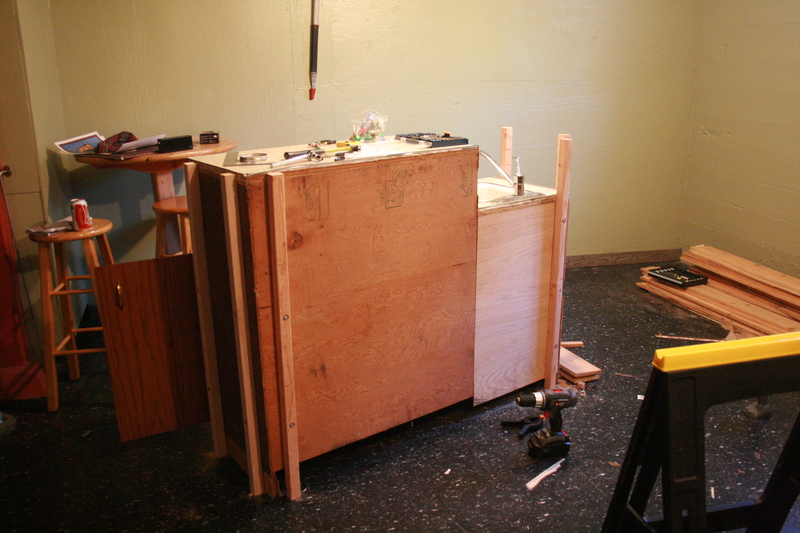 I reinforced the bartop with some shelving brackets screwed into the plywood and 2×2″ posts. I didn’t really have a plan for the bar surface until I came across some pieces of MDF at Home Depot painted with an outdoor chalkboard surface. Perfect! It would be fun to have something to write and draw on, and it is supposedly meant for outdoor signs, so ought to stand up to a little moisture. 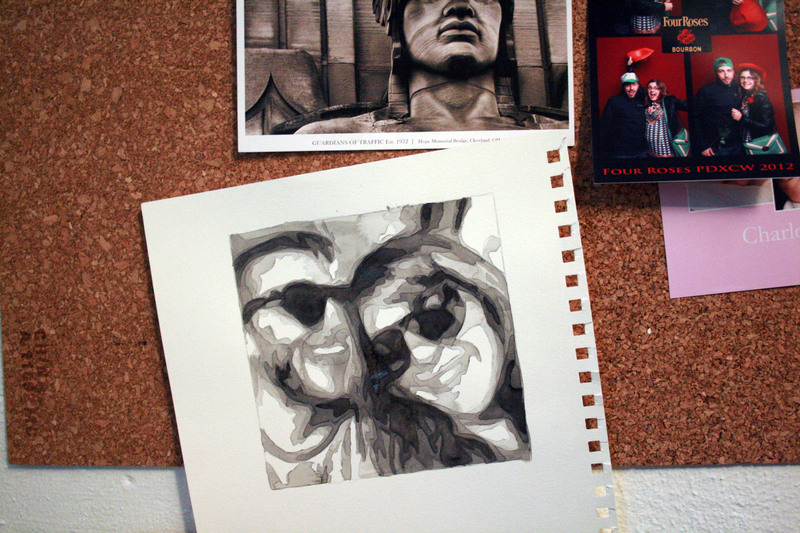 Even if it doesn’t, a 2×4′ piece is less than $10, so it’s no big deal if it ends up ruined. 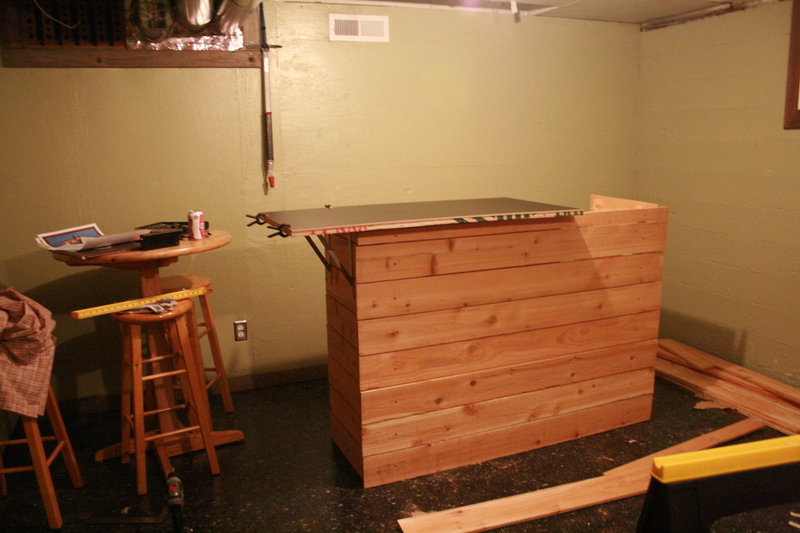 The last step was to add some trim to the bartop to make it look complete (in a rustic sort of way, of course) and I called it a bar. I wanted to put this thing together in time for our, err, “mellow” New Years Eve party that weekend and was able to do it all in about a day. The whole thing might have gone faster without breaks like the one in the following picture, but really, is that any way to DIY a basement bar? Thanks for letting me share, Erin May!